A steady stream of new clients ensures the success of your resume writing business. But how do you get new clients? How do you get your phone to ring? There is no secret formula or magic bullet in marketing your business. The key to success is to select a few, simple, effective tactics and do them consistently. One common mistake is to think that advertising and marketing are the same thing. They are not. Advertising will get you results, but it is not as effective as marketing your services. In order to build your career services practice, you need to cultivate relationships -- with prospective clients, new clients, and referral sources (other resume writers, members of the media, career and life coaches, real estate agents, human resources professionals, etc.). Tell people what you do -- over and over again. And get your message to the same people over and over again -- because consistency creates familiarity. And don't wait until things slow down before you market! It is better to be overbooked. You want to consistently cultivate a pipeline of prospective clients. For more of this article, purchase the Spring 2009 issue of Resume Writers' Digest ($3). A few weeks ago, I wrote about The Power of Who, a book about networking. (It's unique take: You already know everyone you need to know). It reminded me of a story that I told in the Summer 2009 issue of Resume Writers' Digest, in my "From the Editor" column. I wrote about a friend of mine who was seeking a transportation job. One of the first discussions I had with him was about his network -- and, in particular, their importance in helping lead him to a new job. He had already started networking with some folks in his church, but I reminded him to contact his past co-workers (some of whom had been let go in a previous round of layoffs). After a few weeks of searching, he was stuck. So I put out a message to some of my connections about what he was looking for. Within a day, I received a call from a mutual friend of ours who worked in a shipping department of a large manufacturer in a town about an hour away. He had a lead for a transportation company that was possibly going to be hiring a new manager, in my client's town. So I called my client and put him in contact with our mutual friend. This was were it got interesting: My client mentioned that he had a former co-worker that worked at the target company, but that he hadn't talked to him in a few years. I was stunned. Obviously, our discussion about contacting past co-workers had fallen on deaf ears ... because this was the kind of opportunity he should have found out about from his former co-worker. This should be a reminder to us as resume writers: You can lead a client to his or her network, but you can't make him or her use it! Then, I learned about Teena Rose's book, "Cracking the Code to Pharmaceutical Sales." Teena's book picks up where the Insider's Guide to the World of Pharmaceutical Sales left off, offering resume and job search tips for breaking into the industry, including a list of pharmaceutical companies, job banks, and forums. It also offers STAR interview tips, geared specifically towards the pharmaceutical industry. Cracking the Code to Pharmaceutical Sales: The perfect book to help your clients and a job in pharmaceutical sales. The book author knows what she's talking about because she possesses a long history of getting jobseekers into the field! (And because she's a resume writer, you'll find the advice she gives on resume and cover letter development is consistent with industry standards. This is a great resource for your clients -- and it's just $29.95. If, as Randall says, it's even harder than ever to break into the competitive world of pharmaceutical sales, you need to help your clients by giving them every advantage. WSJ Tackles "How to Choose a Resume Writer"
While it's a MUST that the documents you deliver are error-free, perhaps job seekers shouldn't be surprised that they don't get an incredible document for $59. But even a $59 resume should outperform many self-written documents. 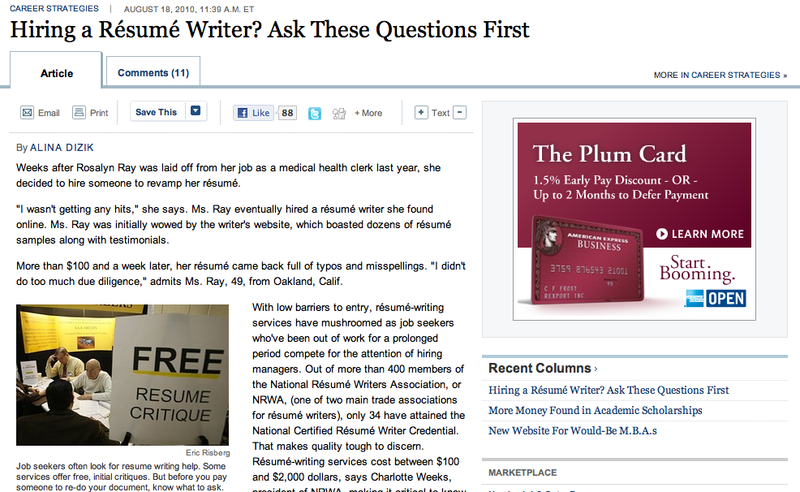 I would also disagree that the five questions suggested will help ensure that the client gets a great resume writer. Following are the WSJ questions and my thoughts on each. "Do you know my industry?" While I agree it's important to be able to understand what your client is talking about, industry knowledge can be a double-edged sword. The "insider" knowledge can tempt the writer (and client) to using too much industry terminology and abbreviations. And you have to remember that often a resume will be screened by someone other than the hiring manager, and if they don't understand what you're talking about, you may not get in front of the person who "gets" all of that verbiage. There has to be a balance. To counter the WSJ's point, a good resume writer can position your qualitative skills and showcase industry relevance without having done the job personally in the past. (On the other hand, I think "niching" is a fabulous idea for resume writers, and I'll have a future post on this very topic.) But just because you're not a former IT professional yourself, doesn't mean you can't write for IT folks. "Can I see samples that aren't posted on your website, please?" Here, the resume writer must be careful, because resume samples on the website should have already been fictionalized (with identifying client information removed). If a client requests other samples, the resume writer must either pull out other already-fictionalized samples or take the time to fictionalize them. What I've found is that if you provide a client with a sample from his or her industry, then he or she expects the finished resume to look like that sample, even if the sample client's experience and qualifications are completely different. (It's like they think there is "one" way resumes in that industry should look.) I've never had a client ask to speak to other clients, but I get a lot of my clients via referrals, so that probably precludes it. (I think you're more likely to get clients who ask to speak to clients if you charge $700 versus $250.) But yes, make sure you put your best work online -- especially some standout designs and absolutely NO errors. "Are you skilled at working with people like me?" This goes back to question 1. But the example given in the WSJ article, like working with a local writer, and one that works face-to-face, are not necessarily good predictors of success in a match between writer and client. Also, from the anecdote given, I'm not sure the new writer had any better success with the client, Ms. Ray, than the previous writer, because the solution presented, to me, seemed to be to "dumb it down" (although Ms. Ray used the phrase "tailor it down"). One of the things I learned from Louise Kursmark is that a mid-to-entry level position resume isn't that different than a six-figure resume -- it still needs to be heavy on accomplishments and client value. "How will you tackle writing my resume?" I'm not sure what to make of this comment from a recruiter: "Resumes edited or created from scratch by lackluster writers are easy to spot because they often read like the experience is too good to be true." He goes on to say, "It's almost always a series of amazing achievements and it looks like it's written by someone who is trying to sell you." Without getting into his head too much, What is wrong with a resume filled with amazing achievements? Well, to be a little bit snarky, I guess it doesn't give the recruiter much to do to "add value" to the process, if the resume stands on its own. I do agree that an extensive questionnaire or over-the-phone interview is necessary to collect information. You simply can't do enough from an old resume and a job posting. "So, what did you do before you were a resume writer?" This is probably the point that I have the biggest problem with, especially this comment from Tim Heard, an IT recruiter (misidentified as "Tom Heard" in the article): "If someone owned a florist shop for 20 years and decided to go into resume writing, I'd question how this person is qualified." Does it really matter what the professional did before becoming a resume writer? A career change is a career change. (Was Mr. Heard always an IT recruiter?) And, as another snarky aside, how confident can you be in an IT recruiter when his website is still "under construction" in many respects? But to address his point: I've known many outstanding resume writers who transitioned from careers other than HR or recruiting. In many cases, this has made them a specialist in working with clients from these professions (which was the point of Questions #1 and 3). I'm happy the profession is getting attention -- and helping consumers choose a resume professional is useful -- but I don't think these five questions are necessarily going to help ensure that a client gets a good experience. Do you have some ideas on what questions might really help make a good match? Ahh... cover letters. 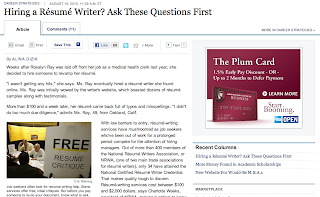 If you're a resume writer, you've probably been asked a million times (I know I have! ): "Do I need a cover letter?" Of course job seekers need a cover letter. They probably need a couple of cover letters, actually. One for applying for advertised jobs. One for sending for unadvertised opportunities. A networking cover letter. A cover letter for recruiters. Some of my best work as a resume writer, in my humble opinion, has been on cover letters. I love how they let your creativity shine through. 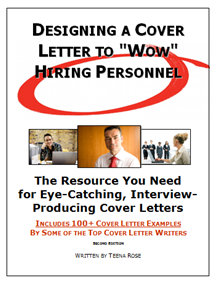 So when I saw that Teena Rose had a new ebook out, "Designing a Cover Letter to 'Wow' Hiring Personnel," I was thrilled! Katharine Hansen calls it "Fresh, innovative, and comprehensive." To order your copy (just $17.77), click here. More Strategies to "Write Great Resumes Faster"
Have you ever stared at a piece of paper (or your computer screen) and wondered, "Now what?" If so, you're not alone. In a "Write Great Resumes Faster" survey conducted by Resume Writers' Digest, 85 percent of the writers who were surveyed admitted to an occasional case of "writer's block," that paralyzing feeling when the words and phrases just won't come to you. One factor in being most productive is finding the right timing that works for you. Nearly a third of survey respondents reported they do their best writing in the morning. Another 16 percent write best in the early, early morning. Sometimes, life circumstances dictate when you can write. As one resume writer notes, "I write whenever my toddlers aren't around or are sleeping!" Another says, "When I'm in the zone, I can work for hours. When I'm not, I tend to be more easily distracted." Some days it's harder than others. "There are good days to write and bad days to write -- creativity is that way," one survey respondent noted. Another writer admits, "Sunlight helps a lot. Cloudy days are not great for me." "Good lighting is important," another writer concurs. "I use full spectrum light or 'happy light.'" Is Your Client an Idiot? Are your clients idiots? Do you charge more than $500 for a resume? If your answer is yes, then the VirtualJobCoach thinks they're idiots for paying that much. The sad thing is that the VirtualJobCoach blog (note: edited to remove link to site, since I don't think I should be rewarding them with traffic for their bad behavior) has some pretty good articles on it (Simon and Barry seem to be nice guys), and the product they offer for career coaches looks interesting (kind of like JibberJobber). But I don't understand why they need to cut other people down in order to promote themselves. Here's a screen shot of the post (and again, I'm not giving the link to the actual site because I don't think they deserve the traffic, and it will only encourage them to do this more). Saw this come across Twitter today (although it appears to be a post from last year). I’m very disappointed in this post. To use your logic, why would anyone buy a $30,000 car, when they could buy one for $13,000? Both of them are going to get you where you’re going. But … aha!! The ride is going to be different. That’s the case with working with career professionals. The end result is the same — to help the job seeker get a job. But our clients aren’t IDIOTS for paying someone $500 or $700 to write their resume. Just as someone isn’t an IDIOT for driving a BMW instead of a KIA. As the editor of a trade newsletter for professional resume writers, it saddens me that some in the profession feel a need to put down their colleagues (and, consequently, their colleagues’ CLIENTS), by calling them an IDIOT for investing in their career. For a team that is selling a product targeted to coaches (CoachesAid) — which many resume writers are also career coaches — I find it interesting that you would insult your potential customers in this way. I look forward to your response. I also learned that Dawn Bugni had addressed this same crew in her "One Bad Apple" post. Apparently, they liked the negative attention (and traffic) that they got from recycling another one of their resume writer-bashing posts (one from April 2009) and decided to do it again. 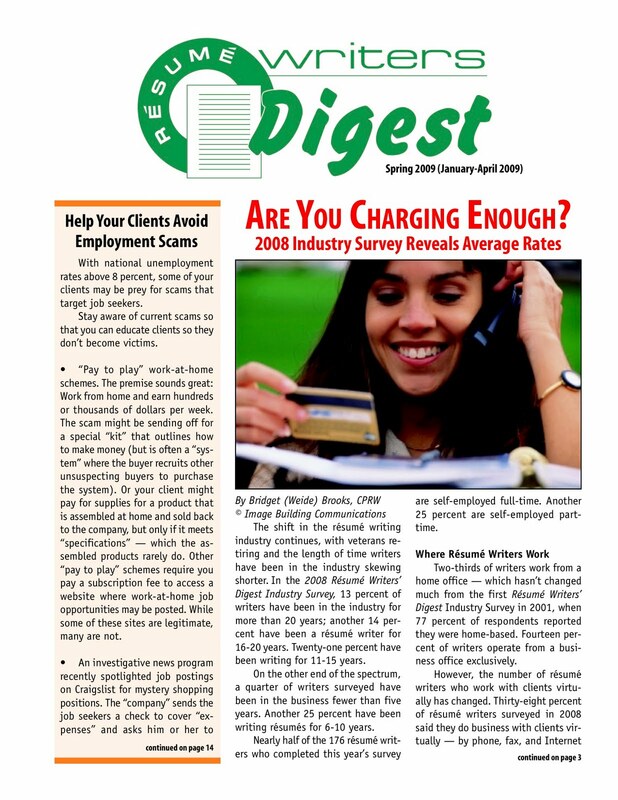 Interestingly enough, the headline of the Spring 2009 issue of Resume Writers' Digest is "Are You Charging Enough: 2008 Industry Survey Reveals Average Rates." The 2008 Resume Writers' Digest Industry Survey results revealed that the average resume sale is $300, but the most frequently reported responses ranged from $125 to $600. 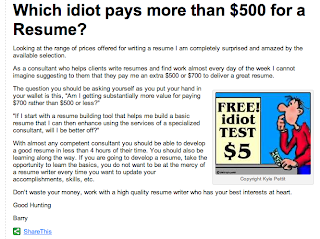 So while most resume writers don't charge $500, there are a lot that do ... and are all of their clients idiots? I don't think so. 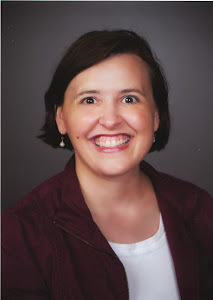 "I was stunned by the resume pricing numbers that Bridget shared from the survey ... absolutely stunned!!" She believes the prices are much too low. She went on to write, "In my opinion, resume pricing should never be a fixed fee, but rather a range. For example, to say that all mid-professional resumes cost $400 is ridiculous. One client may have had two sales jobs and your writing job is quick and easy. The next mid-professional client has had six jobs (four of which he was fired from and worked for less than one year) and lots of other "issues." That writing job will take you twice as long to write, if not longer." The 2008 Resume Writers' Digest Industry Survey revealed a shift in the resume writing industry, with veterans retiring and the length of time writers having been in the industry skewing shorter. In the 2008 survey, 13 percent of writers have been in the industry for more than 20 years; another 14 percent have been a resume writer for 16-20 years. Twenty-one percent have been writing for 11-15 years. On the other end of the spectrum, a quarter of writers surveyed have been in the business fewer than five years. Another 25 percent have been writing resumes for 6-10 years. Nearly half of the 176 resume writers who completed the survey are self-employed full-time. Another 25 percent are self-employed part-time. Certification has lost a bit of its luster among resume writers. Forty-four percent of respondents reported they are certified as a resume writer; 7 percent are certified as career coaches. Another 23 percent are certified as both. Interestingly, however, more than a quarter of respondents are not certified at all. Most resume sales -- nearly 70 percent -- include not just the resume but also a cover letter. References and other supporting documents are often part of the sale (12 percent). For those that reported an hourly rate, charges range from $10 to $400/hour. The most frequently reported hourly rate was $50; the average rate was $93.42. The average resume sale is $300, but the most frequently reported responses ranged from $125 to $600. The average hourly rate in the 2007 survey was nearly identical ($94/hour); however, the average resume sale in 2007 was reported to be $629. The difference may be attributed to economic factors or possibly the absence of some higher-charging resume writers from this year's survey. January continues to be the busiest month of the year (26%), with September (18%) a close second. For the complete survey results write-up, purchase the back issue of the Spring 2009 issue for $3. In November of last year, I partnered with a local PR expert (and former TV news reporter) to offer a "Media Training 101" session for mental health therapists. I've adapted some of her tips for my resume writing colleagues. Tips to help you feel confident and comfortable during media interviews. Craft your message. Be able to state it briefly and succinctly in one or two sentences. Some people find it valuable to write or type out the main point they want to get across during the interview. Reel the interview back to its original focus. It's okay to say, "The point I want to make is..." or "I don't understand why that's important to this interview." Take charge. If the interviewer fails to address something you feel is important to the story, raise the issue yourself. - Contact Margaret Bumann at (402) 618-6313 or e-mail margaret.bumann(at)cox.net for more information about upcoming media trainings or to schedule a media training workshop for your group, association, or organization. Resume writer Jacqui Barrett-Poindexter, owner of Career Trend, will be interviewed on Meet LeadChange today (Aug. 12, 2010). The show will air at 3 p.m. EST. Use this link to listen live or to a replay at your convenience. 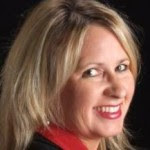 Jacqui: The most important things to know about me is that primarily that my passion and my value to the audience I serve is strategic writing and strategic careers writing. Writing and positioning individuals in the careers marketplace. Serving leaders who are at a point in their career where they want to position themselves in such a way that they stand apart uniquely. They’re not just espousing their leadership, but painting a picture that is colorful and shows the nuances of how they solve problems. And people who, in their careers, are not at that place but, but want to break through. How can they create tracks in their careers and in their career messaging. Helping them understand: What type of leader am I individually? (Integrity-wise, ethically?) Companies are interested in the bottom line, so how do we knit that all together? It’s a real challenge to understand for yourself how to do that very well. We don’t judge ourselves as objectively as we’d like to think. You write for a lot of different websites. That’s a large community of folks that do what you do, right? Folks in the career business who are helping with resumes? Yes, absolutely. What’s happened for me in the last, probably fewer than 3 years, is an explosion of communication throughout the Internet because of social media. I’ve created my own blog on CareerTrend.net that I enjoy and that is driving more of my communication. However, a large part of these affiliations (Career Collective, Resume Chicks, Careerrealism, JobHunt.org, and TalentCulture)… these are all talent/career/jobhunt/resume focused areas that many resume writers and careerists and recruiters and job hunt experts and career coaches aligned together to build a stronger voice that we couldn’t have alone. I appreciate the more than I ever did. I’ve been doing this for 13 years, but the last 3 or so years have driven the point home how important it is to drive the point home. Within the community, you need leaders. There is an interesting dynamic going on. I see this in the leadership world, relative to leadership design, too. There are issues around talent management and defining yourself. Then social media took off and the economy bottomed out. I’m looking at a lot of those places and trying to turn the LeadChange group into this type of thing. I do leadership consulting and coaching. I’m trying to separate my business and the group. I want to create a community of leadership professionals who are doing what you are talking about, in the talent space. We do that too as a collective as a group in these different initiatives. Each of them have their own unique goals and missions. Some of them I’m in a leadership role, and others I’m just contributing. They each seem to have their own mission style and goal. And the participants have their own entrepreneurial ventures to promote. There’s another group where it’s her business, but she’s integrated in a community blog. In my case, CareerTrend is separate from the organization, but it obviously becomes aligned with these organizations and they feed each other. Being in the career management/talent management around leadership space, how do you see career management and leadership overlapping? How do they fit together? Or do you? You want to see some results and you’re trying to help people put the results of what they’ve done in their resume and their information about themselves that they release to the world. Where I was going with this original question was: I think a big part of career management, to me, is actually having done what you wish everybody thought you did. Having the results to show for those kinds of things. I recently had 3 clients, back-to-back, come to the table ready for what I call “the interview.” As part of my process with executives, I have my clients go through a rigorous process that involves a lot of heavy lifting on their part. Once they’re done with that, we go over their high-level, over-arching accomplishments as leaders and try to break them out into stories that aren’t so heavy that the reader gets lost. We think about what it is about their leadership style that sets them apart. I’m thinking in particular about a client who was aspiring towards companies that have a double-profit-margin focus – it’s where the company considers both financial and social consequences for their arriving at their business decisions. You don’t want to dilute the resume with social causes, but you want to blend that in a way to attract the kind of leadership opportunities that they desire. And then pull in their past record to show that they’ve been there, done that. Most people are proud of their stories but they’re so close to them, they forget the level and breadth of what they’ve done because they’ve moved onto the next strategic initiative. Do you see any changes in what people are looking for in a job, or in a candidate, or how they present themselves? I am. I am seeing more people come to me who say, “I really want to make a difference.” There is a lot of hard reality talk involved. Sometimes they’re in the midst of career coaching and they’re fighting that battle: Can I make a difference and make a living? Are they willing to make the sacrifice? There is a lot of internal struggle. There is no easy answer to that, for most people. Also, companies, I see, in the position descriptions, looking for a certain sort of person – mentioning ethics and integrity. I see more of that message. When I was first Twittering last spring and summer, I was following people who were talking about leadership, and then invited them to join the LinkedIn group. We seem to have found a group of people who are passionate about making a positive difference, and not just talking about leadership. We are all challenged by the same thing: Not just doing this to make a buck. I’m hearing that more. I’m hearing more people coming to me, this year than last, who are saying, I’m not in fear of my job ending, but they’re just really tired and it’s as simple as not being thanked or appreciated. I’m hearing it more than I ever have in my 13 years, and it’s not just about the money. The people I work with, the leaders, the ones I really learn from, speak to that. And they speak with such conviction about what has helped them rise to where they are. They want their teams, or the people that report to them, or they collaborate with, to feel that they are the heart of the company; that they’re not just being dictated to. Most recently, I was surprised to hear one of my clients describe one or two opportunities that she passed up on, or even left a role, where she was asked to go against her own value system. And I think that’s a good example. I’m still learning from her “how to be” when push comes to shove. One thing I’m noticing, in my own perspective, is that a lot of us see the emptiness of just pursuing money all the time, or just pursuing trying to be one of the people who hit the home run when the company makes its mint, or whatever. As the group of people who don’t get to hit the home run gets larger, we just get tired of that, so we start saying, “What do I really want to do?” I think built into all of us is a desire is to make a dent bigger than we are. Like Steve Jobs’ quote about making a ding, or a dent in the universe. I think we’d like the impression, when our pebble hits the metal, I’d like the dent that it leaves to be bigger than it was. That’s a good analogy. Another gentleman I’ve been working with has a long career in HR. We wrote his biography recently, which usually gives me a sense beyond their resume of their personal side. He and several others I’ve written for in that way, has been a common thread of being brought up in a situation where they didn’t have a lot, and worked hard, and had a customer service ethic, and achieved this – but they wanted to leave a mark, and make something better than when they came in. It’s hopeful to hear that with some of the bad that surrounds us, if we focus on the good, and those people, then there is a lot of pebbles gathering together to make a difference. How did you get involved in this, from the beginning? I had been in corporate America for 10-12 years and I had a writing degree (a bachelor’s degree, with a journalism emphasis). I liked the written word, and I had been in a PR role with a company. When I separated from my last company, one of the partners actually left (the one I directly worked for) and rather than taking another position, I had this little niggling goal to start my own gig, using my own writing. I wrote a restaurant menu as one of my first freelancing jobs. I continued to do stuff like that, but I advertised to do resume writing. This was back in 1997. I had a little ad in the local Kansas City newspaper that someone at a career management firm saw. They asked me to come and consult for them – but I wasn’t looking for a job. I had a financial severance package to last me for six months. I did start to work with them. I enjoyed it, and did pretty good with it, and one of the partners of that company was the original owner of CareerTrend and she mentored me. Here I was in my 30s, and I hadn’t had much mentorship, but I felt this person doing this for me, so it was a good example for me, and as well for my clients. They offered to sell me a spin-off, CareerTrend, from their company. I liked it enough to narrow my niche and the more I narrowed it, and the more I got involved, I started absolving myself of other types of writing, because it was too distracting. Then I started focusing on the conferences, and training, and the development to be the best I could be. I’m more strategic and gaining the credentials I felt would serve my clients, and serve my business. And that’s kind of how that happened. It was brick-and-mortar when I started, and now it’s totally Internet-based. Was is a difficult transition to go from brick-and-mortar to Internet-based? It was difficult, but yet it was organic. Paying for the overhead – and really, I was in a very high profile business district in Overland Park, Kansas– gave me a lot of confidence, but it became onerous after a while. It was like another mortgage. As the Internet became more integral, I had a website developed, and I did a lot of things that made that happen. I also went through a divorce, which made it a lot harder. But it worked out. You just keep making adjustments. If this isn’t working, how can I contain costs and build revenue? It’s great how creative your mind gets under the pressure of desire. I had a great desire to make it work. I brought it into my home for a while. The partnerships, like ExecuNet. There are so many partnerships, like Career Management Alliance. They’ve given back to me 10-fold. I meet people all over the country, sometimes the world and suddenly you’re lifting each other’s businesses concurrently. Like you’re doing with LeadChange; it’s such a rising tide. There are times when it’s stormy, but if you can not let that make you be afraid to do what you need to do. If you can keep your focus on what you want to do. That’s what happened for me. You reference not being afraid. I think doing courageous things are the least scary. What we call courage in hindsight is the least fearful option. I ask this question to everybody. Jim Holland asked me this question several weeks ago. When we talk about character-based leadership, it’s less about the character traits, and more about the character. It’s about leading about from who you are. That makes everyone a leader. We are all self leaders. When did you first begin to realize you had some leadership ability? I was trying to think about this and I already used part of my response, which was: Where my business has gone. That introduced me to more leaders, and made my need for understanding leadership more necessary. I sometimes think I’m in leadership roles, and sometimes I don’t. I have a board role, for example, in Career Management Alliance, which requires leadership in a particular area (the credentialing), which is good for me. There seems to be a morph from when I was following — and I know you don’t like that word, “following” – but I was doing my own thing; I never liked to be told what to do. But I wasn’t in a leadership position, per se. I was just trying to grow and be the best I could be. You aspire to be like the people in the industry who are the named leaders. I’ve had a couple of people comment on me being a leader, but I think it’s just more a comment on my activities. LeadChange is very visible on Twitter; it’s very real-time and visible. This has allowed me to lead and be led by so many people. I enjoy that back-and-forth. I understand that ultimately in business, you have to have someone making the decisions, and I get that. Sometimes I’m making the decisions, and sometimes I’m seeding the leader with some ideas. I had a couple of people in my industry I work really closely with projects, and one of us takes over the ultimate leadership role. I don’t see myself as a leader in general, but functionally, and in certain instances. I have to lead my business. That’s the challenge. There’s a dichotomy between the position-based activity and the internally-inspired activity. Position-based followership is what we always talk about. No one want to grow up to be a follower. For me, it’s just been transformative. My business has just changed so much, the texture of it, the past several years. People I may never have met – I hopefully would have – so many people I communicate with daily, I didn’t even know. I may have heard of them, but even then it was a blip on the screen. We have so many opportunities; it can be overwhelming, but if we keep our center about us. Is there one message or one idea you’d like to give people? You sound like a question I’d ask my clients, because that’s a big question. I think there’s so much to be hopeful for, and groups like LeadChange contribute to that. Be involved and get involved and we can’t be involved in every group, but step into areas of discomfort and start exploring and you’ll find that your life, and career, and business will improve. Don’t ever get stuck in the same-old, same-old, and you’ll find opportunities to grow, and that can grow you. Just keep moving. If you are looking forward to doing something different with your career messaging, especially in a leadership role, get in contact with Jacqui. You can reach her @ValueintoWords on Twitter. I love to converse, rather than just tweeting and retweeting. 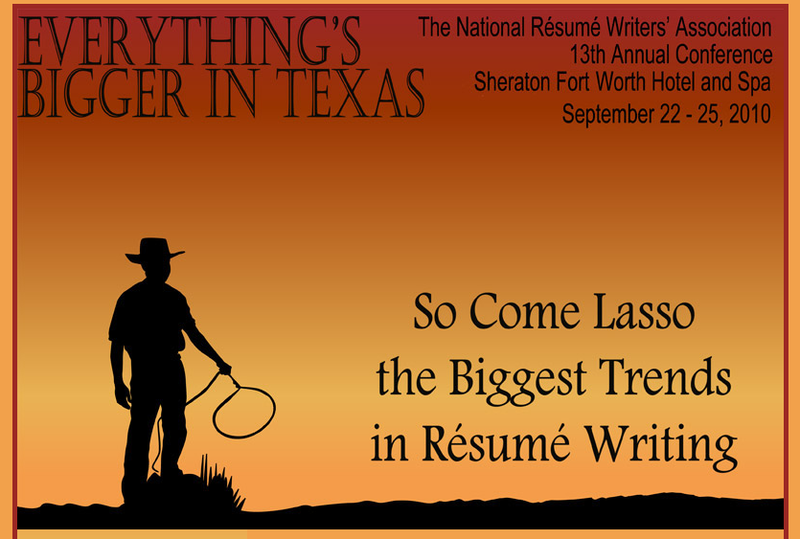 The National Resume Writer's Association is holding their annual conference in Texas this year ... Fort Worth to be specific... from Sept. 22-25. Early registration discounts are available until Aug. 20. Current NRWA members pay just $425 (new/renewing members pay $525) for full conference registration. A two-pay option is available for early registration (through Aug. 20). Single-day and partial conference registrations are also available. Internet scams are everywhere. Just this past weekend, I received a classic e-mail scam ... it was an e-mail purporting to be from an esteemed colleague of mine. It said he was stuck in London and needed me to wire him some money. Fortunately, I'd heard of this scam before and didn't fall for it. But how many of us have clients who are falling for employment scams or work-at-home schemes? The answer is: Too many. 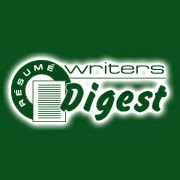 In the Spring 2009 issue of Resume Writers' Digest, I pointed out some scams you should warn your clients about. With the e-mail I got this weekend, it's a good time to remind you of these. "Pay to Play" work-at-home schemes. The premise sounds great: Work from home and earn hundreds or thousands of dollars per week. The scam might be sending off for a special "kit" that outlines how to make money (but is often a "system" where the buyer recruits other unsuspecting buyers to purchase the "system). Or your client might pay for supplies for a product that is assembled at home and sold back to the company, but only if it meets "specifications" -- which the assembled products rarely do. Other "pay to play" schemes require you to pay a subscription fee to access a website where work-at-home job opportunities may be posted. While some of these sites are legitimate, many are not. Remember that everyone you meet is a potential referral source. The best resume writers are specialists, not generalists. That means that you have the opportunity to gain referrals from your colleagues who don't work in the same areas you do. I am always looking for writers who are really good at what they do when I attend a conference. As a result, I've made referrals to writers who specialize in military transition resumes and federal resumes -- all from contacts I've made at conferences. Participate in workshop sessions. Don't be a wallflower -- get involved! Ask questions. Approach the presenter after the session. Take part in the group activities.... even if you're shy!! Follow up after the conference. Most conference organizers will give you a list of everyone who participated. E-mail these folks ... connect with them on LinkedIn, Facebook, and Twitter. These are great connections to continue in the virtual world! Enjoy the conference ... and if you'd like to write up a session or two for a future issue of Resume Writers' Digest, send me an e-mail! E-mail me at editor(at)rwdigest.com. There is no college degree offered at the moment for resume writing, so the next best thing (or, from my perspective, even better than a degree program!) 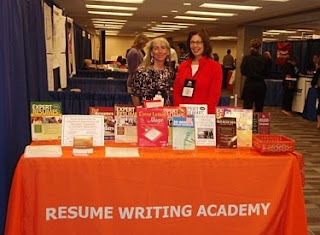 is the Resume Writing Academy, offered by Wendy S. Enelow and Louise M. Kursmark. Billed as "the nation's premier resume training organization," RWA offers comprehensive training for resume writers looking to improve their skills or for new professionals looking to enter the industry. The program includes eight weekly teleseminars and three independent learning programs. 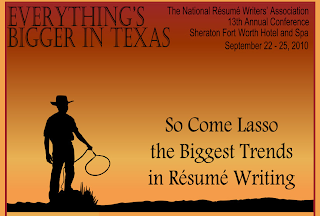 Program graduates are eligible for ACRW (Academy Certified Resume Writers) credentialing. www.resumewritingacademy.com or call Wendy Enelow at (434) 299-5600 for more information. When writing a resume, the information you are able to collect from clients makes a huge difference. Ask the right question, and you can unlock a treasure trove of valuable accomplishments and insight from the client about his/her value to the employer. In your performance reviews, in what areas did you receive the highest scores or the most positive feedback? What have you achieved in your job -- have you saved your employer any money or achieved any other quantifiable measure (helped the company make money, become more efficient, improve safety, improve customer service, etc.)? What have you introduced at your firm that has never existed before ... or what did you improve upon? What sets you apart from other candidates for this job? For more client questions and tips for effective resume writing, purchase the "Write Great Resumes Faster" special report for just $14.